If you’re a classroom teacher using technology to helps students uncover knowledge and create something original, you are certainly making good use of technology as a tool for learning. Unfortunately; however, you may be struggling with time management issues if you’re still engaging students in traditional methods of presenting what they’ve learned by standing in front of the class. I’d like to suggest an alternate, more efficient presentation method to maximize instructional time and take advantage of an additional opportunity for engaged student learning. One way to efficiently share presentations is to have students use screencasting tools to record and narrate their presentations, then publish those presentations in one place, like a Glog. This allows students to use class time to interact with the presentations and answer the Essential Questions that fuel the student-driven learning experience. The Essential Questions for this Project Based Learning unit are listed at the top of the Glog. Completed group projects are published on a Glog for a culminating classroom activity. Class sharing time provides students with the opportunity to interact with individual presentations to uncover knowledge and find answers the Essential Questions. A learning task is assigned to the activity to provide a focus and accountability. In this case, students are required to create an annotated Google Map, to provide a big-picture overview that answers the Essential Questions. Other suggestions include a simple Exit Ticket or a written summary to draw conclusions. Here is more information about the tools used in the example: Click on the links to jump to my wiki for more information. Essential Questions: Deep questions that guide the learning and cannot be answered by copying and pasting. Google Presentation: The GoogleDocs version of an online, collaborative presentation tool. YouTube: Upload and publish screencasts, then copy the link displaying in a glog. Good idea. 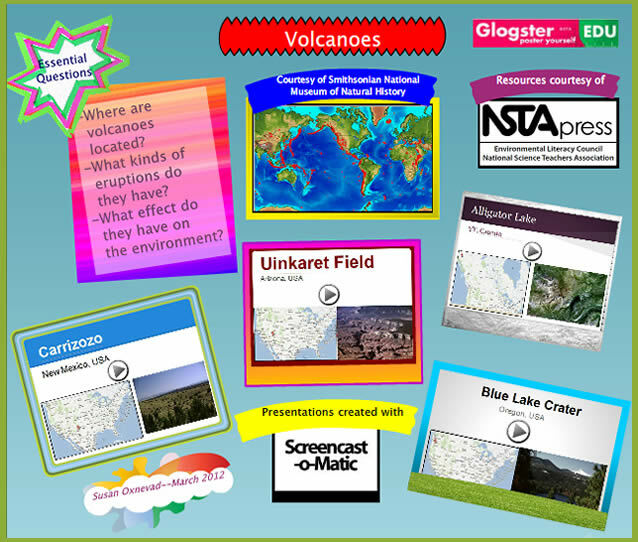 I have been linking student projects to Glogster and my learning page already, but adding the screencast sounds like it will make things work even better.